It’s Poetry Friday and thank you to this week’s host Robyn Hood Black for an interesting article about the Poetry Friday science anthology! Coincidentally continuing the science theme, I’m dedicating my Poetry Friday post to the lunar eclipse that happened earlier this week. I stayed up late to witness the shadow crossing over the moon and the full eclipse was a fuzzy orange blur to my naked eye. It was a really cool experience, especially since full lunar eclipses are rare; we’re lucky that this is the first of four expected within the next couple years. 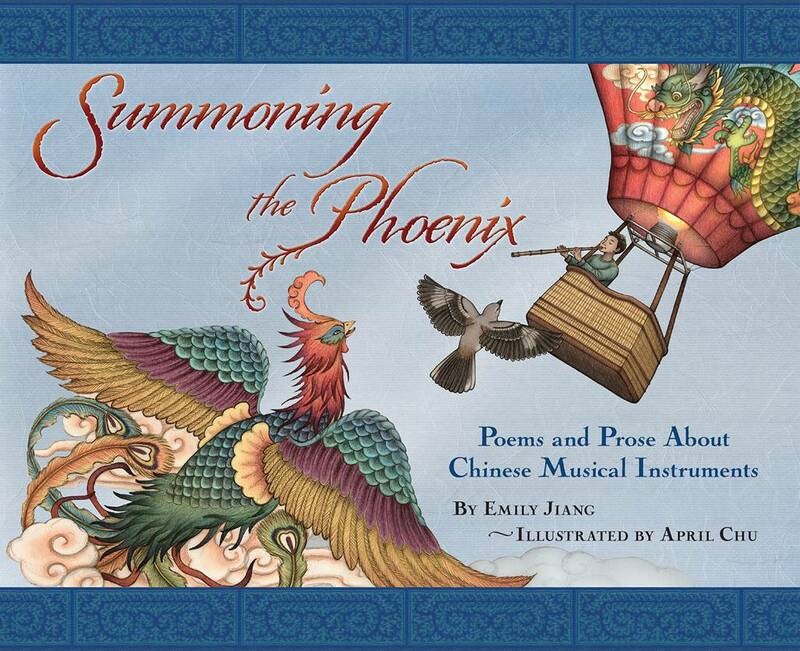 So in today’s post I’m sharing two poems referencing to the moon: “Night Thoughts” by Tang Dynasty poet Li Bai and my original poem about the Chinese moon guitar, “The Face of My Ruan” from my new picture book Summoning the Phoenix: Poems & Prose about Chinese Musical Instruments. Please note that I discuss these poems a little more in depth in a couple guest blog posts linked below. The first poem I learned by heart from my parents was a poem written over one thousand years ago in China by one of the country’s most famous poets, Li Bai (701-762). Read the rest of my analysis at my guest post in celebration of National Poetry Month at Emily Kirsten Anderson’s Blog. My translation of “Night Thoughts” and a recording of the choral music I composed using the English text was published as part of A Pentatonic Moon at Interfictions. Now I’d like to share a poem from my picture book Summoning the Phoenix about the ruan, also known as the moon guitar. You can read a little more about my thoughts about this poem in my interview at The Ink Splat. I love including haiku in my blog posts. You can also read my write up in prose and in haiku about the first of four book parties celebrating the launch of Summoning the Phoenix in the San Francisco Bay Area. If you live in the area, you are invited to three more book parties in three more weekends! Next Next post: Interview in the Palo Alto Weekly!